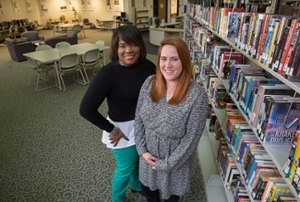 The SIUE East St. Louis Learning Resource Center (LRC) will hold weeklong events during its grand opening from Monday-Friday, Feb. 6-10 at the East St. Louis Higher Education Campus, Building B, 601 James R. Thompson Blvd., East St. Louis. Currently, hours are from 8:30 a.m.-5 p.m. Monday-Friday. Southern Illinois Collegiate Common Market (SICCM) operated the library on campus, which had to close June 30, 2016 because of the state budget crisis. 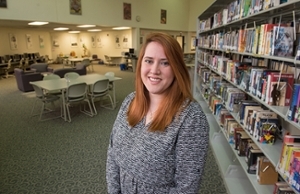 The ESLC reopened the library as a resource center on Jan. 17, which was made possible through funding from the Illinois Community College Board. “Our vision for the Resource Center is to not only assist the ESLC participants and their families, but also to benefit the community,” said Johanna Wharton, director of ESLC’s Workforce Development and Strategic Partnerships, which oversees the Resource Center. “East St. Louis has a public library on the other side of town. There are many people who are in need of computers and assistance for such essential tasks as filling out resumes, employment applications and health insurance forms, and we will be able to help. Programming will include computer literacy geared to senior citizens, Jennings noted. Hours for the Resource Center will expand based on the needs of the community. Lara Jennings, director of the SIUE East St. Louis Library Learning Resource Center. Jennings with Vera Jones, parent specialist, who coordinates programs connecting parents to educational and employment resources at the LRC and at Vivian Adams Early Childhood Center.